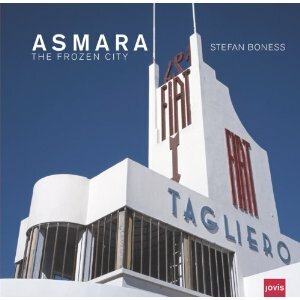 Asmara, the capital of Eritrea, is a city that has captured my imagination to great extent, this is in spite of never having been there. The city itself was once the jewel in the colonial Italian crown and as a result has acquired many aspects of Italian culture into its everyday being. This ranges from the café culture on the wide boulevards to the splendid examples of Italian Art Deco architecture. The years have not been kind since the time of the Italian occupation. His Imperial Highness Haile Selassie and later the military dergue that ruled Eritrea as a province of Ethiopia neglected and repressed the region and years of revolutionary conflict against Ethiopian rule resulted in time, and architectural fashion, passing Asmara by. This book documents the remnants of that Italian Art Deco foray into East Africa in photographic for, with some contextualising words, in order to highlight just how frozen in time many aspects of architecture in Asmara continue to be to this day.